Single drive. 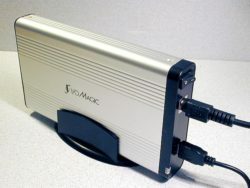 A single drive can be bought with all the necessary parts included or the enclosure and the internal drive can be bought separately to be assembled by the customer. The ready-made option is a quicker and more economical way to add storage space but unfortunately it often comes with shorter warranty and on occasion suffers from reduced throughput. Multiple hard drives are another option.They provide a very large storage capacity and can be used for a large archive. Another advantage of multiple drive configurations is that the drive box is reusable. In other words, you can swap drives in the drive box for higher capacity drives as your business grows or as you outgrow the capacities of existing hard drives. In general, external desktop hard drive is a great for onsite backing up of important digital files including videos, photos, records, and other important documents. When your primary hard disk suddenly crashes or your computer runs into fatal problems that prevent you from accessing data, you will have the backups to restore your data back to your computer after it is fixed. It is important to note however that external desktop hard drive is more prone to failure than internal hard drive. So it is advisable that you have an offsite backup drive to safeguard against loss of vital information in cases where all onsite backup data is damaged or lost. What is a computer external hard disk drive? What is external portable hard drive? The owner of this website, hddclub.com, is a participant in the Amazon Services LLC Associates Program, an affiliate advertising program designed to provide a means for sites to earn advertising fees by advertising and linking hddclub.com Review to Amazon properties including, but not limited to, amazon.com, endless.com, myhabit.com, smallparts.com, or amazonwireless.com. 2017 Hddclub.com All rights reserved.